Get a professional cleaning. 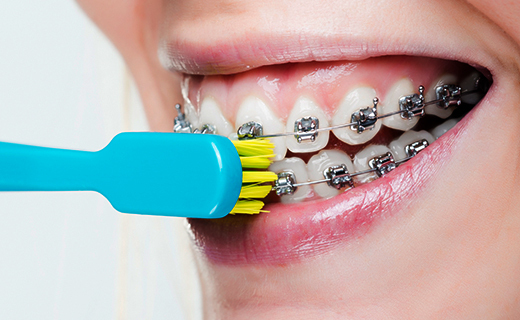 Professional cleanings are essential to basic dental care, but may be required more frequently with braces. Talk to your orthodontist about the frequency of cleanings and when it is best to seek professional cleanings. Many experts recommend cleanings after each tightening. You will also need to alert your family dentistry expert that you have braces, as special tools may be necessary to ensure proper cleaning. To reduce the spread of acid that can erode the tooth enamel, rinse your mouth with warm water before brushing. Swish several times and spit to neutralize acid and dislodge debris. Rinse your toothbrush with hot water before brushing. Toothbrushes can harbor bacteria, but rinsing before use can wash away harmful surface germs. You may want to run clean fingers over the bristles a few times as you rinse your toothbrush to further rid the bristles of any trapped debris. Rinse your toothbrush again with hot water following use. Replace your toothbrush every three months or as it becomes worn, whichever comes first. 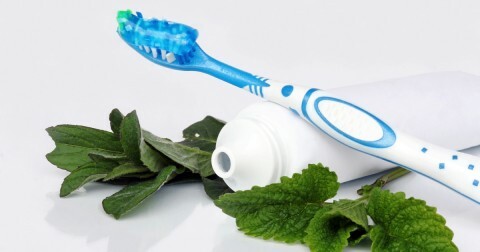 Apply toothpaste to your toothbrush and begin brushing. Dedicate at least two minutes to your brushing routine, dividing your mouth into quadrants and focusing thoroughly on each section. You may find it necessary to spit as you free debris while brushing. 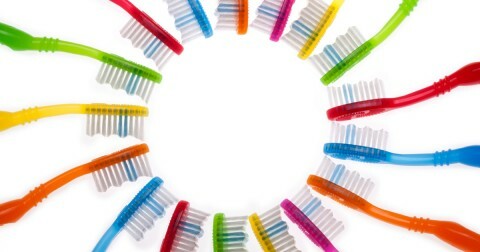 You may find a special proxy toothbrush is necessary to work between brackets and wires. These toothbrushes look like miniature Christmas trees and can reach between each bracket as well as between the wire and your teeth to dislodge debris and scrub off bacteria. Once-a-day use, at minimum, is recommended. Replace often to reduce exposure to germs and bacteria. Be certain to brush your tongue as well as your teeth. Cleaning the tongue not only helps keep your breath fresh, but it also reduces bacteria that lead to gingivitis. Gargle with salt water morning and evening. Gargling with salt water can free debris, reduce gingivitis, and neutralize acids. Reduce or avoid sugar consumption. Sugary foods are known to do lots of terrible things to your health, and the same is true of your teeth. Sugar joins with the bacteria of the mouth to form acids that erode the teeth. Avoid sugar, if possible. Eat fruits and vegetables. Vitamins, minerals, and antioxidants in fruits and vegetables can ward off oral diseases and contribute to your overall health. Braces for kids cost time and money, but with proper care, the end result will be worth every moment of your time and every penny spent. You are in control of the outcome—diligent dental care is essential for the best results. Dionne and Dr. Wilson always make my experience great. They have wonderful personalities, especially Dionne. I love engaging in conversation with them. Great place as everyone is pleasant and welcoming. Very professional!